3.	to compare Quality OptimiZer reports to EP 23 recommendations. 1. We examined analytical processes, Q.C. processes, patient volumes and costs from two laboratories x two instruments x five analytes. c.	simulated a shift that would cause 5% of results to fail TEa limits. 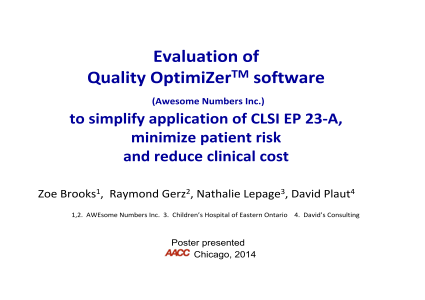 e.	quantified patient risk, clinical and laboratory costs of each QC process. 4. We selected one sodium control to illustrate the importance and interaction of the seven numbers required to manage quality. a. Laboratory practice for all controls on all tests was to use a 1-2 and 9x rule as warnings, and 1-3, 2-2, 2/3-2, R4 rules as rejects. b. The assigned mean was 0.7 SD below the measured mean; the SD was assigned at 2.1 x the measured SD. c.	The OptimiZer Q.C. strategy would detect a clinically-significant change sooner, prevent risk to 1330 patients, save 66 patients from clinically-misleading results and result in a net saving of $1,062.00. e.	implement and modify a 5-part Q.C. strategy. 1. OptimiZer Q.C. processes fulfilled EP23-A requirements. 2.	decreased patient risk, and reduced clinical costs. 3. Error detection is impeded by the common practice of assigning mean and SD values from inappropriate sources and using outdated Q.C. rules. 4. Laboratory quality would benefit from increased staff focus on clinical quality and the interaction of the seven numbers that drive and assess that quality.